Our team just returned from the Favela slums. While we were there we were able to participate in art education, dance, sports and games, with children living in extreme poverty and at a high-risk of trafficking. 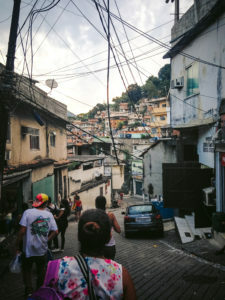 In the Favela slums young girls get taken advantage of, they are often seen as a commodity for drug lords and local gangs. Jardim Gramacho has been known as Rio de Janeiro’s garbage dump, one of the largest landfills in the world. It closed down in June 2012 after 34 years of operation. When the garbage dump was operating, the favela residents got a daily salary. However, because of the lack of education in the favela slums most of the landfill workers spent their wages on the same day they received it. Since the landfill was closed 3 years ago, the families living in Gramacho have to fight to survive daily, because of the lack of education and job opportunities. To be able to change this community, the whole mindset in these slums needs to change. Yes, opportunities would help, and yes, we believe the government needs to take better responsibility of their residents, but the favela inhabitants also need to take control over their own destiny. We believe that when girls/women rise up and get access to education and are given assistance to find employment opportunities, the Favela communities will start to change, and that change will help shape and better the community for generations to come. During this trip some of our ladies were able to sit in on a talk with some of the young girls in Gramacho. Our leader, Nadia talked about dreams and thinking ahead, she talked about child/teenage pregnancy. It was inspiring getting to hear some of these young girls dreams. Some dreamed of becoming a doctor, a teacher, a computer specialist, an actress etc. A very high percentage of girls living in Gramacho have children before their 18th birthday, many don’t get education because of this. Well known tattoo and mural artist, Jon Hall was a part of our team for the second year in a row. He is the perfect artist to bring to the Favela slums as he is known for his murals of women. He portrays women in a strong, inspirational, and empowering way. To us his art work perfectly portrays what Passport 2 Freedom is all about. It was wonderful to see that the other initiatives are doing great and growing. We want to thank everyone who helps us do what we do by buying our apparel and donating to us. We can’t do what we do, without YOU!